Weavers Cottage Self-cateringA delightful detached character cottage for two in a great location. In it's elevated position it commands stunning panoramic views towards Brotherswater and the central Lake District Fells. 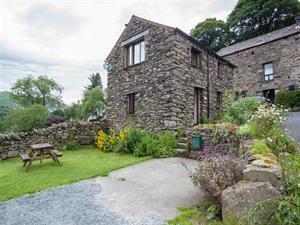 One of a cluster of Lakeland stone properties nestling in the tiny hamlet of Hartsop, Weavers Cottage was an agricultural building dating back to the 17th Century. In the 1970s it was converted by an artisan for use as a weaving studio. Weavers Cottage is a locally important building and due to the historic character of the building and its prominent position, it is protected by The National Trust. The footpaths to the High Street Ridge, Hayeswater and Angle Tarn pass the door. A very pleasant day can be enjoyed on beautiful Ullswater, one of the largest lakes, take the steamer cruise to How Town and walk back along the eastern shore, or hire a little rowing or sailing boat on the lake. There are a number of pubs in the area but the cottage is well equipped for 'staying-in' and would admirably suit those who wish to cook at home and relax in quiet surroundings. A delightful detached character cottage for two in a great location. In it's elevated position it commands stunning panoramic views towards Brotherswater and the central Lake District Fells. Weavers Cottage offers weekly bookings starting on Saturday.